Name of the table: With RowShare, a table is not a file. It is the basic unit for organizing and sharing information. This first section of the page displays the name of the table, its author and its icon as well as optional description and tooltip. Click on Settings to modify this information. Quick actions bar: RowShare offers a set of features for your table’s data. 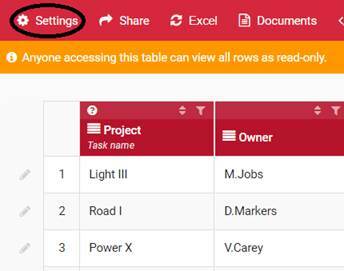 For example, you can export your table in any format you wish or generate documents from your table’s data. Columns: They define the structure of your table and facilitate data entry. They ensure your information remains consistent over time. Rows: They are made up of as many cells as your table has columns and they allow you to enter your information according to each column type. Each RowShare table is unique. Don’t hesitate to personalize a table to describe how it works and make it as easy as possible for each contributor to enter data. Table name: Change the name of your table. Color: Change the color of the table header (the line where column names appear). Description: Add more precise information to describe your table what you expect from your contributors. This will be displayed below the table’s title. Tooltip: The Tooltip appears over a question mark icon next to the table name. It is limited to 256 characters. Show column totals: Once this option is activated, a new row appears at the bottom of your table and shows the number of rows you have access to and the sum of cells values in each column where it is possible. Number of rows and sums do not consider filters. Image: Add an illustration image of your table. Culture: Choose the most suitable language for your table’s data. Numbers, currency and date columns will be displayed according to this language. Main column: Choose the column that best describes each row. The values of that column will be used in email notifications to specify the rows that were modified. By default, this is the first column. Table settings can be changed at any time by the table owner(s). To sort a column without going to the column menu, simply hover your mouse to a column header and click on the arrow icon. One click sorts ascending, a second click sorts descending, a third click resets to the table default order. When your table is already sorted, Ctrl + Click another column sort icon to create a sort on several columns (Not supported on macOS). To filter a column without going to the column menu, hover your mouse to a column header and click on the filter icon. When you sort or filter data from a table, the information is stored in your Internet browser (Google Chrome, Microsoft Edge, Internet Explorer, FireFox, Safari, etc.). This means that when you return to the table with the same browser your sorts and filters will be kept. But if you return from another computer or browser or if you clear your cookies, the table will return to its default (sort, filter and column width).